KABUL, Afghanistan — A suicide bomber rammed his car packed with explosives into a bus carrying government employees in the Afghan capital early on Monday, killing 24 people and wounding 42 others, Kabul's chief police spokesman said. The Taliban claimed responsibility for the assault. The attack took place in a western Kabul neighborhood where several prominent politicians reside and at rush hour, as residents were heading to work and students were on their way to a nearby private high school, said Basir Mujahed, the spokesman. "The bomber attacked at one of the busiest times of the day," the spokesman said. "There were traffic jams with people going to work and to the university and schools. Many of the shops had just opened." Several residents of Kabul who were lightly wounded in the explosion criticized the lapse in security measures they say enabled the bombing. Amir Helam, whose friend died in the explosion, told Afghanistan's Tolo TV that "every day people are dying. If you cannot bring peace then please leave and bring other people." The bus was completely destroyed, along with three other cars and several shops in the area, said Mujahed, adding children were among the wounded. Noorullah, who uses just one name, was in his dormitory at a nearby university when the explosion occurred. He says he "saw so many injured people and cars burning." Noorullah received minor injuries from flying glass. Kabul has been battered by explosions claimed by the Taliban and by the Islamic State group's affiliate in Afghanistan. 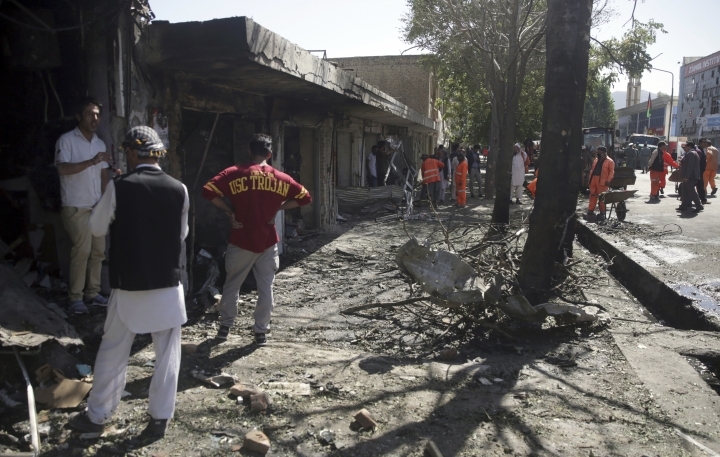 On May 31, the Afghan capital saw its worst suicide attack since the Taliban's collapse in 2001 — an attack that killed 150 people and wounded scores. In a statement the Interior Ministry called Monday's attack "a criminal act against humanity." The police spokesman said the minibus was carrying employees of the mines and petroleum ministry. The Taliban, in a statement to the media, said they were behind the bombing and that the attack was carried out by an insurgent only identified as Ahmad. 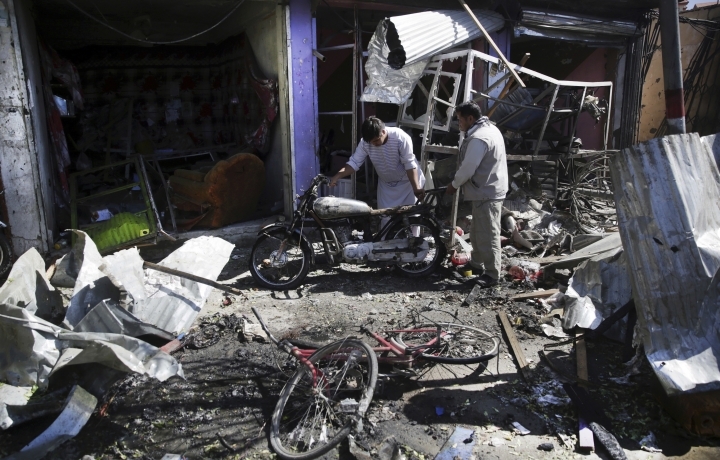 Taliban spokesman Zabihullah Mujahid, said the target of the bombing was the intelligence services and their employees. He claimed the bus was filled with employees of the intelligence services and that Taliban insurgents spent the last two months shadowing the intelligence services employees before carrying out the attack. He also claimed 37 people were killed, but the Taliban often exaggerate their battlefield gains and death tolls. Afghan President Ashraf Ghani condemned the bombing. "Once again, these terrorist are attacking civilians and targeting government staff," Ghani said in a statement. Pakistan issued a statement condemning the attack and saying that "terrorism is a common enemy." Pakistan has been bitterly criticized by both the United States and the Afghan government for providing safe havens to Taliban insurgents, a charge it strongly denies. Both countries routinely accuse the other of harboring their enemy insurgents. Monday's attack was the second against employees of the mines and petroleum ministry. Last year, a bus carrying the ministry's employees was also targeted in an attack that killed several people. The western Kabul neighborhood where the attack occurred is home to many prominent political leaders, such as Hazara leader Mohammad Mohaqiq. Several attacks have occurred in the neighborhood, including the suicide attack last month that killed prominent Shiite Muslim cleric Ramazan Hussainzada, who was also a senior leader of the ethnic Hazara community. Eyewitnesses to Monday's attack said shattered glass from nearby buildings was scattered all over the street. "The sound was very strong, the ground shook," said Mohammed Nader, who owns a convenience store in the neighborhood. The Taliban have stepped up their attacks against both Afghan forces and civilians since U.S. and other NATO-led foreign combat troops pulled out of the country at the end of 2014, leaving only an advisory and training contingent of international forces. In addition, American troops in Afghanistan have a counterterrorism role. The insurgents have also steadily expanded their reach across the country, staging offensives targeting entire towns and expanding their footprint. The Afghan military and security forces, with 195,000 soldiers and more than 150,000 policemen, have struggled to contain insurgency on their own.